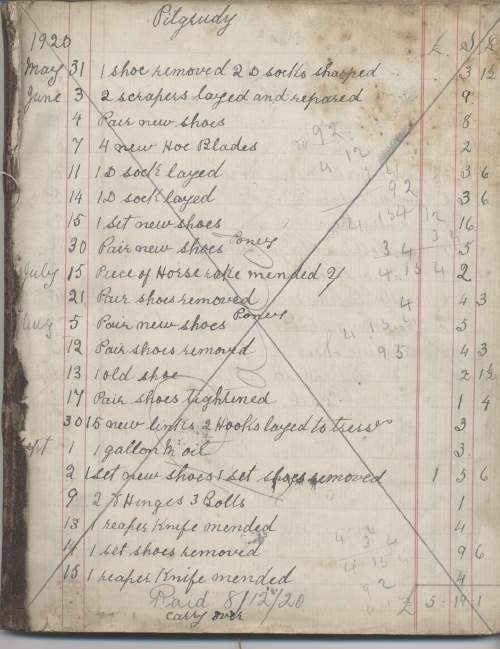 Cash book of William Mackay, blacksmith, Dornoch, 1920-1923, includes purchase invoices and income tax bill. Cover of dark blue cardboard. I am wondering if this is the same William MacKay who was my 1st cousin (4 x removed) who was a Blacksmith in Dornoch. The 1881 census (age 24) for him has his occupation as Blacksmith. His father James was also a Blacksmith. He died 5 January 1939 and lived at Gilchrist Square. I assume what was known as a Blacksmith forge (behind the Eagle pub on the High Street) would have been where he worked.